A Brownstone & Pre-War Specialist, in the construction industry, is a company that works in buildings built prior to 1910 - 1920. These Pre-War buildings are typically called Brownstones but also include Townhouses, Carriage-Houses, Limestone & a few other variants from the Pre-War era. To become a specialist in this field can only be accomplished through experience. Many Contractors & Chimney Companies claim to be Brownstone & Pre-War Specialists from the day they open for business. 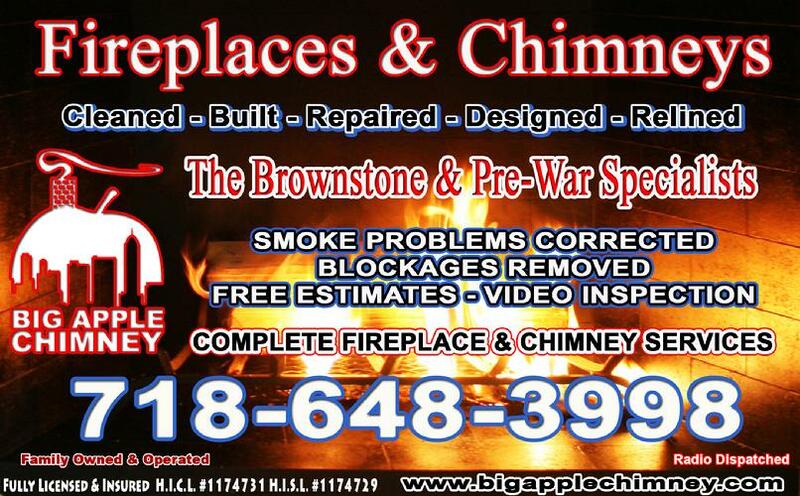 "New York's Premier Brownstone & Pre-War Specialist"
Fireplaces & Chimneys, Repaired, Rebuilt & Restored. If it's important to you when choosing a contractor to have a legitimate specialist in this field, You must check their references. Only your neighbors can tell you, if you are using a company familiar with Brownstone and Pre-War buildings. Do not be fooled by false advertising and wild claims by out of state and inexperienced chimney outfits. Remember, the buildings in New York City are like nowhere else in this country, the NYC buliding codes are strict and change rapidly, you need a specialist in the field, who has the knowledge and experience necessary to work properly within these structures and guidelines. Awareness of the building materials and the details of Pre-War design allows us to enter a workspace without causing damage to the surroundings. We are well experienced in protecting and preserving the moldings, marble mantles, antique finishes, trim, plaster, furniture, art and all the other aspects of pre-war buildings that help to maintain it's value.